Today we’d like to introduce you to Steven Soong. Thanks for sharing your story with us Steven. So, let’s start at the beginning and we can move on from there. In 2006 I was a freshman at UC Irvine and I had no idea what I was going to do with my life. At the time, I spent most of my days playing basketball, stuffing myself with dorm food and just doing enough to get by. Seeing I was lost and without a life direction, my big sister did a very big sister thing. She sat me down and gave me a mini-intervention. During our heart to heart conversation, she mentioned, “Can you see it now? We can start our own family optometry practice together!” At the time, she was a first year optometry student at UC Berkeley. Was she trying to convince me to become an optometrist based on her own bias? Or was she just trying to give her younger brother some motivation and purpose? Who knows? Whatever she said, it worked. I went on to graduate with my doctorate in Optometry in 2013. After graduation, I was officially a doctor of optometry and it was time for my first job. Not realizing how optometry saturated southern California was, I settled for a full-time job in Bakersfield. My first job taught me a lot; I realized the standard of practice taught in school was not the same standard in the real world. In 2015, my sister and I opened Bright Vision Optometry in Chino Hills with the intent to provide the highest standard of patient care. Our goal is to earn each patient’s loyalty by providing services with the highest level of professionalism, integrity and respect. We aim to provide a modern, clean, technology driven and family-friendly environment for our patients. As of today, I feel like my sister and I are doing a great job of honoring our promise. Get an eye exam from us and see if you think so too! The 1st month that we were open, a group of Ocean’s 11 wannabes broke into our office and took some of glasses and sunglasses. Fortunately, we were prepared and the damage was minimal. I learned right then that starting a small business will never been smooth sailing and accepted that there will always be bumps on the road. I would have to say finding good, solid staff members, ones you can count on and trust is the hardest bump on the road. Luckily, my sister and I have been blessed with smart, committed and hard-working people. We couldn’t be more thankful for all of them. Cool fact: 2 of our past staff members are now currently in optometry school, shooting with their optometry dream of their own! Alright – so let’s talk business. Tell us about Bright Vision Optometry – what should we know? Bright Vision Optometry stands for the highest level of service in eye care. Our optometry office is conveniently located in the city of Chino Hills. Nearby cities include Chino, Pomona and Diamond Bar. We provide eye care services including eye exams, dry eye exams, red eye exams, LASIK consultations, glasses prescriptions, contact lens prescriptions, specialty contact lens fittings (multi-focal soft contact lenses, hard or gas permeable contact lenses, keratoconus and orthokeratology “ortho-k” fittings). 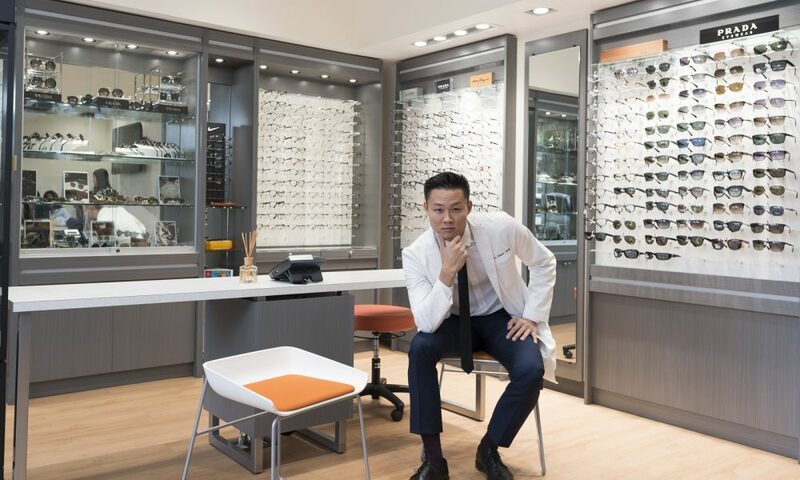 On our optical side, we provide high-quality, cutting edge optical frames including glasses and sunglasses to enhance our patients’ look, lifestyle and image. Our frame inventory offers a wide selection of brands at your disposal. We hand-picked our brands very meticulously considering comfort, style, fashion and fit. Our mission is to provide unique frames you won’t find anywhere else in Chino Hills and surrounding cities. We aim to introduce patients to lesser known brands such as Oliver Peoples, Red Rose, Prodesign, Woow and much more. We are consistently updating our frame boards with the newest styles each week. We are confident you will find something you like! Ask us about our Asian Fit glasses frames! Being open to any person or any idea. It’s hard to know which road will lead you to success, why not be open to all of them? Of course, there are obvious roads that will lead you to nowhere and that’s where learning comes in.